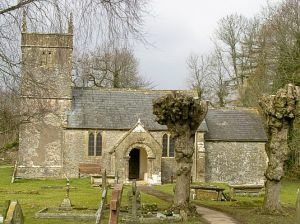 Set apart from its village, St Andrews, also known as Holcombe Old Church, is a simple Norman church with Saxon origins. St Andrews is also known as the 'Plague Church', but more on that in a moment. The Norman building was remodelled in the medieval period, and again in the Stuart and Georgian eras. The interior furnishings strike a decided Georgian note, with a west gallery looking over the nave, where you will find a carved pulpit, box pews, and reading desk. The walls retain a row of hat pegs; a typical Georgian feature. The village of Holcombe was badly affected by the Black Death of 1348, and as a result, much of the village houses surrounding the church were buried, and villagers moved away from the site to the current village location about a mile away. The mound covering the old houses are quite noticeable around the church. One persistent story suggests that it was the effects of the plague in Holcombe which gave rise to the nursery rhyme, Ring a Ring o' Roses, and indeed, one of the pubs in Holcombe was traditionally called that (it has since changed its name). Explorer Captain Robert Falcon Scott's family memorial is located here, and although his name is upon the tomb, he is not buried at Holcombe. In the churchyard is a poignant memorial to five children who drowned nearby in 1899. The church is not used for regular worship and is in the care of the Churches Conservation Trust.